I don’t recall when or why it came to be, but my favorite song is “What a Wonderful World” by Louis Armstrong. It’s been recorded by several artists, but in my mind no one does it better than the original. Have you heard of the Enneagram? It’s a model of human personality understood and taught as a typology of nine interconnected personality types. It centers on motivations and encourages spiritual growth. You can learn more about this subtle but complex model here. Today you just need to know that I am a Four on the Enneagram scale. Really simply put, Fours feel all the feelings on an up-and-down roller coaster of emotions throughout the day. We are often introverted and can be self-absorbed if we’re not careful. We also tend to be moved by nature, art, and music more than the average person. Maybe that’s why “What a Wonderful World” strikes a chord in me. I notice “skies of blue and clouds of white, the bright blessed days, the dark sacred nights.” On more than several occasions, I’ve eased my car onto the shoulder of the road to take in a beautiful sunset or impressive storm cloud on the horizon. I tune in to the sound of birds singing outside my window before my eyes even open. And, indeed, when I observe these things my heart soars with awe and wonder at the masterful creation of our God. 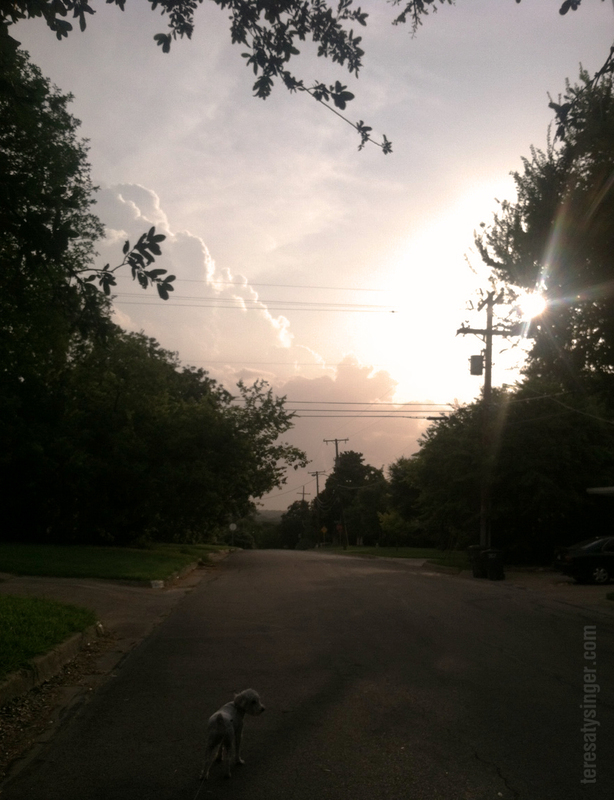 I’ve come to enjoy my evening walks with Luna, our miniature schnauzer, despite the increasing Texas heat. (Mama loves air conditioning!) As we turn the first corner of the block we face west and are most often met with the setting sun. A few nights ago, the view was particularly spectacular. (If you click on the photo and look close, bottom center, you can make out my sweet Luna!) The clouds were billowy, towering high as if they’d topple at any moment. Shades of pink and orange layered from the horizon. The warm breeze, a few degrees cooler than previous nights, blew Luna’s ears back as she stood in it’s path. Her eyes closed, letting it wash over her. One of God’s little creatures appreciating the wonderful world she lives in. What moves you? What stops you in your tracks to take notice? What makes your heart sing with praise to the Creator? What moves me right now is being able to move; typing’s a bit painful, but – doing it. Blessings, Andrew! You inspire me every day. Likewise, Teresa. I enjoyed your comments on Books and Such today. Today I would dance to The Cure’s “Friday I’m in Love”, which melody is going through my head. Since I don’t want to dance alone, I shall share the video (which has to be the goofiest one ever made…watch for the flying pig.). Great song, Andrew! Hopefully, you can tap your toes. 🙂 And I love goofy.